Planning For Retirement For Physicians Part 11: State Teacher’s Retirement System, Yes Or No? 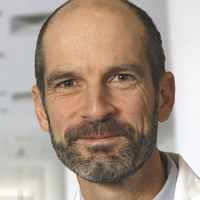 This is the eleventh in a series of posts made in preparation for a presentation I will be making for physicians in fellowship training at an upcoming ACCP meeting. In this post, I’ll be covering the pros and cons of state teacher’s retirement systems. This post will mainly apply to those physicians pursuing an academic career at a university. Most states have a special pension program for teachers and university professors, including physicians who work at universities. In Ohio, we have STRS, the State Teacher’s Retirement System. Although each state’s teachers’ retirement program will be different, I’m going to discuss Ohio’s STRS. If you work at a university in a different state, you’ll need to be familiar with the specifics of your own state’s system to decide if it is right for you. In Ohio, STRS is currently financially healthy but that is not currently the case for every state. During the recent great recession, most pension plans really suffered and lost a lot of their value. But they still needed to pay out a fixed amount in pension payments every year. So Ohio STRS, like many other state teacher’s retirement systems, came dangerously close to having projected future liabilities exceed projected future income. This made state legislators and taxpayers nervous since they did not want to have to bail STRS out with taxpayer money. It also made new physician faculty nervous since they were worried that they might end up putting money into STRS and not getting it back out again once they retired. Now that the recession is over, STRS is healthy again but it does illustrate that a pension is an investment and like any other investment, it has risk. Its just that the risk is relatively low compared to most of the other things you can invest in. One thing to keep in mind about Ohio STRS: it is a substitute for Social Security. In other words, you will not have Social Security payroll tax taken out and consequently, you will not be getting Social Security checks when you turn 65 or 70 if you are a teacher in Ohio. If you have other income, for example, you worked enough years and contributed to Social Security before becoming employed at a university, or maybe as a professor, you have some outside income from consulting, etc. that is subject to Social Security payroll tax, then you may be eligible for Social Security benefits in addition to your STRS pension benefits in retirement. However, the federal government will look at the amount that you get from your STRS pension and your Social Security monthly payments will be reduced, fairly drastically. In my case, because of my work history, I’ll have STRS retirement benefits and will be eligible for Social Security benefits. But my annual Social Security benefits will not even be enough to make 4 months’ worth of mortgage payments. Bottom line, if you have STRS, don’t count on much (or maybe anything) from Social Security. When we first become employed as faculty members in Ohio, we have some irrevocable decisions to make. The first is whether to participate in STRS or in the “alternative retirement plan” or ARP. In the ARP, you can put your money into an investment of your own choosing, a lot like a 403(b) or 457 plan. When you take the money out in retirement, you can take it out however you want but when you have taken it all out, it is gone. So, unless you have other investments, you could find yourself at age 70 or 80 and broke with no income. 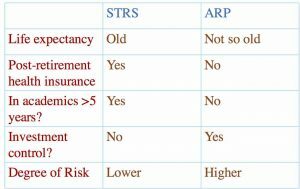 If you decide to go into STRS as opposed to the ARP, then you have to decide whether to do the “defined contribution plan” or the “defined benefit plan”. For details about the differences between these, refer to the 2nd in this series of posts. The vast majority of physician faculty will choose the defined benefit plan with the result that you (or your surviving spouse if you die) will get a fixed monthly income for the rest of your life. My father was a physician and university professor who died when I was in college – STRS helped support me in my last year of college and in medical school and I am eternally grateful for that support. There are federal contribution limits for STRS that are currently set at $265,000. That means that you can only contribute to STRS up to that amount of salary and anything over $265,000 needs some other retirement investment option. For many universities, that will be a 415(m) plan that will kick in if you make more than $265,000 per year. The 415(m) plan will typically be with an investment company, such as TIAA-CREF, and it is not with STRS. If you go the defined benefit route, then you do not get the maximum benefit until you have a certain number of years of service. That used to be 30 but when the recession hit, the number in Ohio was increased to 35. Therefore, if you leave academics to go into private practice, you will not get the maximum retirement benefit. With any defined benefit pension plan, you are, in essence, taking a gamble that you will out-live other people in your age range and ensuring that no matter how long you live, you’ll always have at least something to live off of. As physicians, there are two variables that make us different than most other teachers in STRS. First, the average teacher starts his or her career after completing their master’s degree at about age 23 or 24. The average physician does not start his or her career as a professor until after completing residency or fellowship between the ages of 27 to 31. Since the years of service to get full retirement benefits in Ohio is 35 years, the average teacher will be eligible to retire at age 57 whereas the average physician with a 3-year residency will need to be age 62 (although in some residencies, you can start contributing to STRS during residency and this will lower the retirement age). Therefore, a physician will typically have a shorter life in retirement to fund than the average teacher. On the other hand, physicians tend to have healthy habits: we have access to good preventive medicine, we rarely smoke, and we usually exercise and eat right. So we hopefully can live to an older age than the average American. One other aspect of STRS to be aware of is where the contributions come from. There is an “employee contribution” of 14% to STRS and also a “university contribution” of 14% to STRS. On the surface, it looks like the State of Ohio and consequently the Ohio taxpayers are funding university physicians’ retirement accounts to the tune of 14% of their salary. BUT, the Ohio State University, like most other universities, gets the funds to pay for the “university contribution” from the physician practice plans and not from state government. Therefore, in essence, we the physicians fund the “employee contribution” by a 14% reduction in our gross salary and we also fund the “university contribution” by transferring the equivalent of 14% of our salary from our clinical practice income to the university. Thus in reality, the physicians are paying for the entire 28% STRS contribution and the taxpayers of Ohio pay nothing. So, should you choose STRS or the ARP? If you think (like I do) that you are going to live a long, long time in retirement, then having a fixed income that you can count on every year is an advantage but if you think you are only going to make it 5 or 10 years after you retire, the ARP is the better option. STRS has the ability to contract with health insurance companies for good group prices on health insurance policies and this can be a plus if you are going to retire before you are eligible for Medicare; no one knows if “Obamacare” will be repealed by politicians in the future so no one really knows if health insurance exchanges will continue to be available in the future – having the confidence that you can get access to affordable health insurance no matter what happens in the future can be a plus. If you think you are going to stay in academic medicine for your whole career, then STRS is a good option but if you think you may leave to go into private practice after a few years, then the ARP is the better option. If you are a control freak and you can’t stand someone else overseeing your investment, then the ARP is better for you since STRS will make all of the investment decisions regarding your retirement account. Lastly, if you are risk adverse, go with STRS – even though STRS (like all investments) has risk, in the long-run, that risk is a lot less than putting your money in the stock market yourself. So, what is a new faculty member to do? My own advice is that if you have access to a defined benefit pension plan (such as STRS) as one component of a diversified retirement portfolio, do it. As an academic physician, you are going to have a lot of additional investment options including a 403(b), 457, and a converted Roth IRA that will give you that diversification. You may not have Social Security. Having the relative security of a fixed monthly STRS pension for the rest of your life will allow you to be more aggressive in your other retirement investments by not needing to have as high of a percentage of your retirement portfolio in low-risk bonds. This will allow your retirement portfolio to have a higher percentage of stock that are both riskier than bonds but in the long-run, will pay off more. In the final post of this series, I will summarize the key points from all of the previous posts.